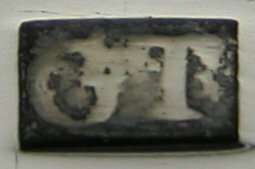 Jackson records a maker’s mark of “GT” ascribed to George Thompson, but it is unclear of the date. Also the mark shown by Jackson has pellets, whereas this mark does not. It is therefore by no means certain that these tongs are by George Thompson. They are heavy, King’s pattern tongs with concave arms and a shell bowl, very typically Scottish. They are dated 1829.